This area is one of the earliest mining districts and gold was mined from numerous epithermal quartz veins intersecting the Stiavnica stratovolvcano of miocene age. A geological description of this area has been published in the ACTA Mineralogica-Petrographica, IMA2010 Field guide series, trip SK3, Vol 29, 2010 by Peter Kodera & Jaroslav Lexa. The area is located in western Slovakia, about 130 Km NE of Bratislava. The field trip details (august 2010) are here. The Rozalia vein, which is a few km west of the village of Banksa Stiavnica, is one of many veins in this area. A small gold mining operation provided access to quartz ore in the bins at the crushing plant. The geological context of the 6 samples collected is uncertain. 3 of these samples have very low decrepitation intensities, which is normal for epithermal fluid inclusions. But 3 samples show substantial decrepitation intensities which is characteristic of mesothermal veins. None of the samples show low temperature decrepitation caused by CO2 rich inclusions and it seems these fluid systems were dominantly aqueous. 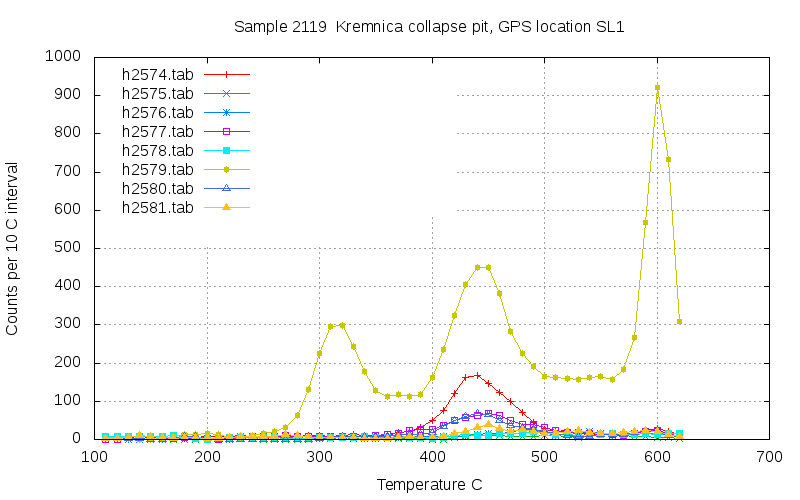 The geological context of quartz samples from the Kremnica pit is unclear because this pit was caused by collapse of the underground workings during an earthquake. 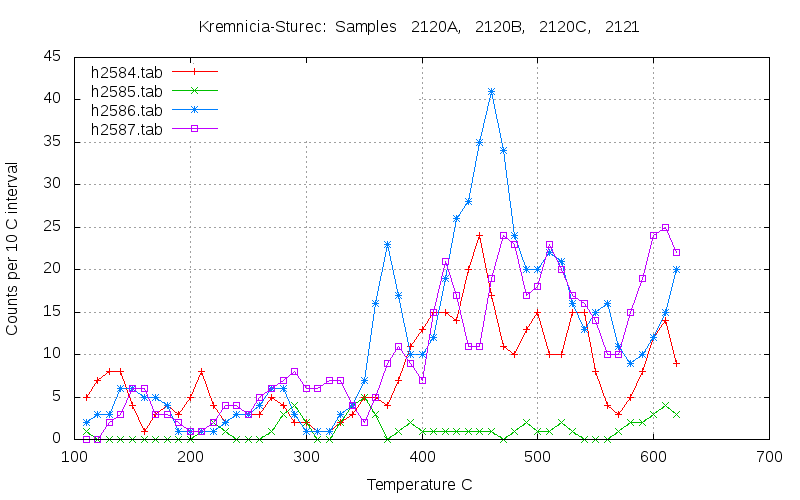 Most of the samples show only weak decrepitation and no low temperature CO2 peak. 2 samples have moderate decrepitation intensity and sample h2581 has a very prominent peak at 310 C caused by CO2 rich fluid inclusions. There is a mixture of quartz types here including epithermal and mesothermal. An attempt was made to collect quartz from some of the old underground workings area, although no actual workings were safely accessible. These samples showed very low decrepitation intensity with no CO2 and are probably of epithermal origin. One sample, h2585, has no decrepitation at all and may well be a chert sample rather than hydrothermal quartz. CO2 occurs only rarely in the samples collected in this mining district, in contrast to the archaean type quartz vein gold deposits. 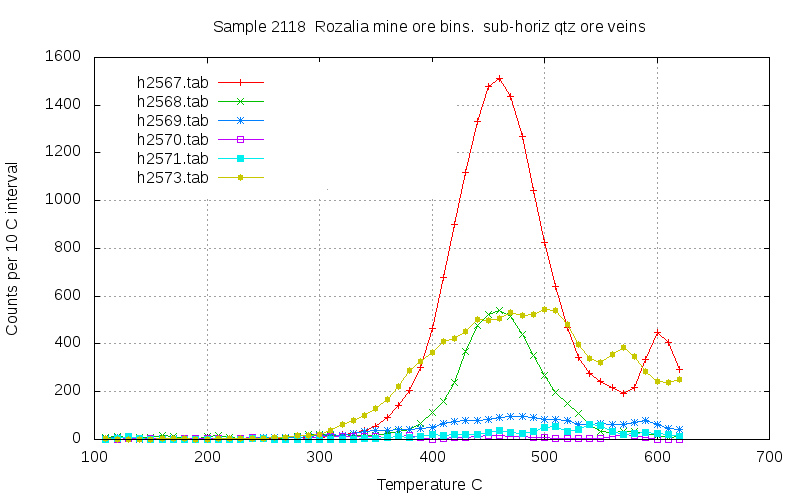 Most samples have low decrepitation intensity consistent with a high level epithermal origin for the quartz. But there are occasional exceptions and it is likely that there are some mesothermal systems amongst the mostly epithermal systems in this district.